This one is new to me but apparently it’s been a thing for VAG, BMW, and apparently GM owners. Instead of a trunk-mounted CD player you got this hefty music box with a 20GB cartage you could fill up with music. It’s supposed to come a USB desktop cradle, software (probably for Windows XP systems), and mounting hardware. I searched the forums at Miata.net but only a handful results showed up for NB generation posts; no one appears to have bought the accessory for the NB and I can’t even find a picture of it installed in a Miata! I doubt anyone bought this option due to several reasons. The first is the fact that it took up valuable trunk space (the NB2 Miata head unit supports the option for a built-in 6-disc CD changer, so no loss of trunk space) and that iPods and other handheld devices were already offering 20GB or more capacity with aux-in jacks becoming more popular in vehicles. It’s a rare accessory as it was only available for the 2005 model year, the last model year of the NB generation, of which was cut short one due to a plant fire on December 15-16th, 2004. The fire damaged the production lines and Mazda made the decision on January 27, 2005 that 2005 MY Miata production would stop to begin re-tooling for then-upcoming NC Miata. (This also ended Mazdaspeed Miata and Roadster Coupe production.) There’s also the cost of the accessory itself. While it’s not listed in brochures, one Miata.net forum member complained a dealership was charging $800 for it! No thank you, I’d rather keep CDs in the car for a lot less! Is this rare Miata accesory? Yes. It is worth anything? Unless there’s an equivalent of a Radwood for vehicles of the early 2000s or Mazda USA wants one for their running collection of cars (has anyone found them a working Miller Millenia S from 1995?) then I’d say no. Phatnoise was offered on later Mazdas including the NC MX-5, the Mazda3, and the Mazda6 until support stopped in 2007. There’re fans out there who’ve learned ways to modify them to increase to capacity to 120 GB if you’re so inclined. Little is known about this option and Google isn’t returning any relevant results of what it’d look like on an OEM 3-spoke steering wheel. It was available for 2004 and 2005, as seen in the brochures. I highlighted the option with a red box around it. Note: the footwell lamp kit, no pictures of the OEM solution exist. Just lots of DIY photos and aftermarket kits. Offered ‘04 to ‘05. 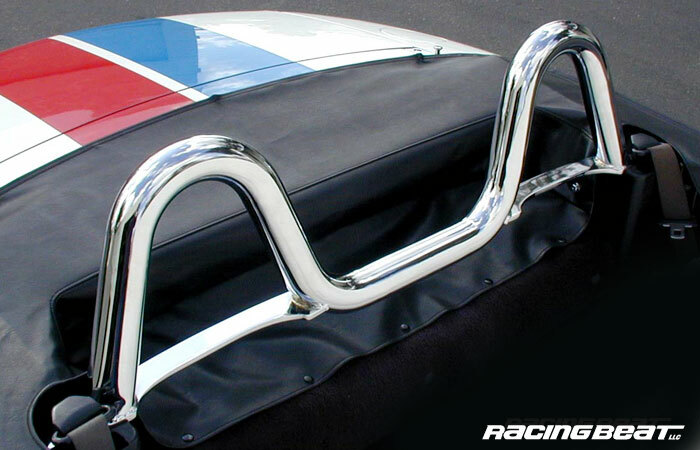 This style bar was found on the UK-spec “Phoenix” and “Arizona” limited editions. Racing Beat is a well-known aftermarket parts company specializing in Mazda for over 45 years. In fact, Mazda and Racing Beat worked together to produce the limited-edition 2001 Mazda Protege MP3 using Racing Beat suspension and exhaust components. I wouldn’t be surprised if Mazda offered Racing Beat’s style bar as an OEM accessory until it was pulled for safety reasons I discussed above. I know there’re quite a few Miata owners on here. Would anyone happen to have one of these options on their NB Miata? If so, then please post pictures of it.